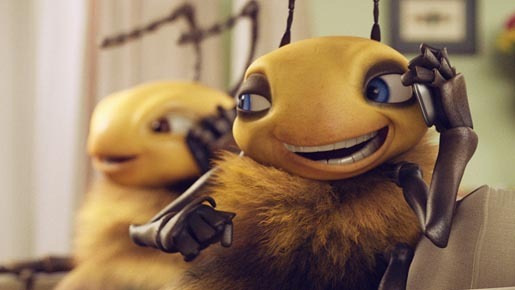 Vodafone in the UK is promoting the Pay as you go deal with the Freebees, an advertising campaign featuring animated bees. Bee friends share the gossip with each other on Vodafone’s special deals, in two television commercials and online at www.vodafone.co.uk/freebees. The Freebees campaign was developed at BBH London by creative director Simon Veksner, creatives Diego Oliveira and Caio Giannella, and agency producer Natasha Wellesley. Animation was produced at againstallodds, Stockholm, by creative director Derek Picken, executive producer Josh Thorne, producer Fritte Colliander, production coordinator Rima Kassar, with director of photography Ben Moulden, Passion Pictures producer Debbie Crosscup, executive producer Hugo Sands and live action producer Patrick Duguid, concept artist and illustrator Johan Idesjö. 3D and post production was done at Milford Film & Animation by VFX supervisors Robert Krupa and John Roxenhed, producer Johan Gustafsson, project manager Martin Wido, 3D artists Sebastian Ekan, Bjorn Henriksson, Daniel Holmgren, Stefan Lagerstam, Hannes Drossel, Elias Rydberg, Tim van Hussen, Francis Paulsson, 2D artists Jacob Welner, Fredrik Bengtsson, Gustav Tell, Gabriel Pettersson, Michel Guillemain, Sofie Ljunggren and Fredrik Pihl.